Set sail for an epic saga stretching from London, all the way to Never Land and back. Before you can say, "Pixie dust, away!" -- Wendy, John and Michael Darling join JAKE AND THE NEVER LAND PIRATES for a soaring, swashbuckling, full-length adventure. Captain Hook -- fed up with being portrayed as a bumbling fool in Wendy's magical storybook -- flies the Jolly Roger to London and snatches the book away, so Peter Pan calls on Jake and his crew to help save the day. But there's no time to lose, because the longer Hook has the book, the faster everyone's memories of Pan and Never Land will fade away... forever! 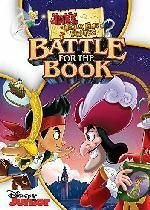 Overflowing with action-packed fun, beloved PETER PAN characters and four additional episodes, BATTLE FOR THE BOOK is an unforgettable celebration of teamwork and the magical power of storytelling.